Cherish Each Precious Day: Relax! Can't believe it's the end of another week! I've made a fun card, using products from Crafter's Companion. 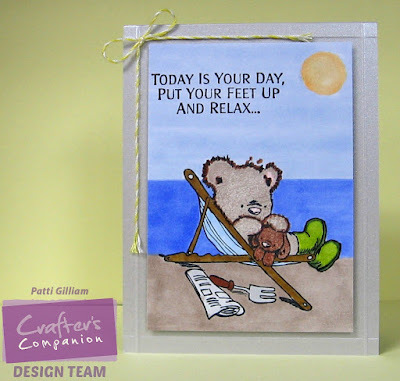 I'll see you back here next Friday with another fun project for Crafter's Companion! Cute card! I love the little bear, and great job with the coloring. Relaxing, happy card. Very cute - the teddy is darling all kicked back enjoying some relaxing time. That is indeed very cute! I love the relaxing beach scene too. He is so laid back and enjoying life! Great card Patti, love the cute image. This is such a sweet and warm-looking scene (it's really chilly here today). It made me smile just to look at it. So cute. I really love your Crafter's Companion work. Super cute Patti! love it! Ooooh I'd love to be there relaxing beside that beautiful calm ocean, great card Patti! Oh, Patti, what a sweet little bear (I have a love for them, having a lovely collection of teddy bears - some from my mom's collection that I inherited). And what a beautiful and peaceful scene you've designed. I want to be there - to put my feet in the sand and wade into the ocean. Beautifully done, sweet Patti! And enjoy your granny time! Hugs! This is so cute. What an adorable little bear. I love it! I hope you're having a fabulous time with your grandbabies! Oh, this card is so cute and super duper darling - quite the charming little scene you have created here for that fuzzy bear!! So fun to see this - hope all is well with you!! Sending hugs! !